A recent study has come up with some interesting numbers regarding the way black hat hackers think of themselves and thier arguably malicious activities. 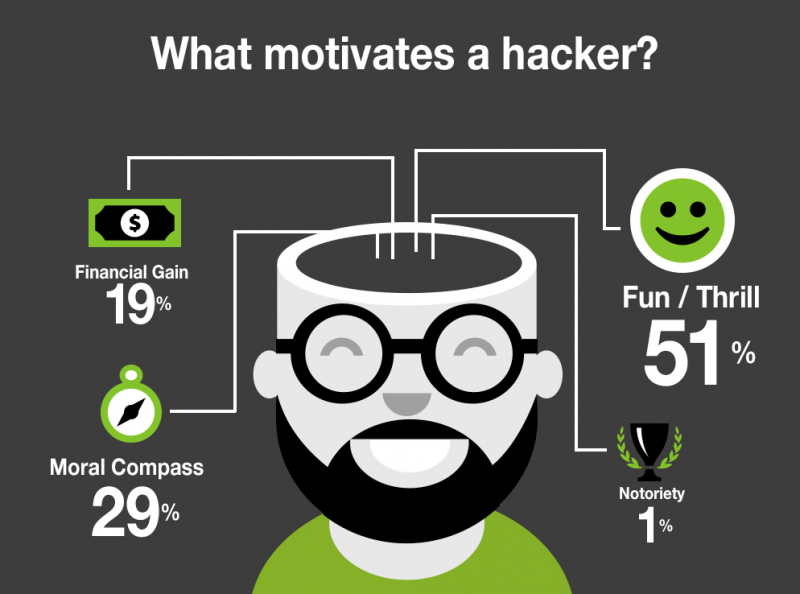 A password security software company known as Thycotic conducted a survey during this year's Black Hat 2014 that says 86% of hackers do not believe they will ever have to face repercussions for their actions. While many of them believe they are above the law, over 50% of those surveyed said they aren't in it for the money, but rather just for the fun of it. Only 18% said they were motivated by financial gains and 29% claimed to be hacktivists driven by exposing the truth regarding various issues. Just recently a group of hacktivists attacked the St. Louis Police Department and leaked dispatch tapes regarding the Michael Brown case. Thycotic says many of attacks being conducted still make use of tactics that were used 10 years ago or more. Nearly all of the hackers the company interviewed said that basic phishing and spoofing techniques are still effective, but 47% say users are learning to avoid these techniques. Whatever the motivation and tactics may be, according to Thycotic the particular 127 different individuals interviewed do not believe what they are doing is wrong. However, they don't feel invincible either, 88% of these hackers believe their own data and privacy is vulnerable to attacks from fellow hackers.